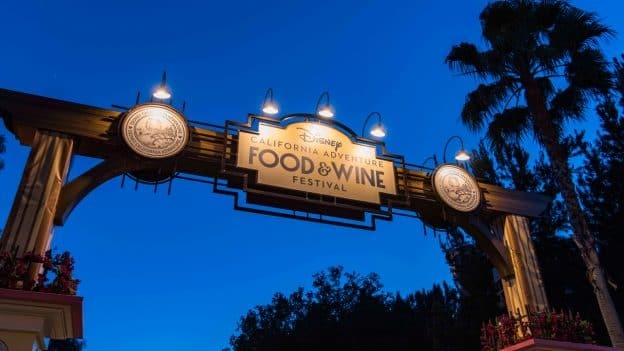 Food & Wine Festival at California Adventure: Something for Everyone! The Food & Wine Festival that takes place every Spring at Disneyland is a fun experience for locals and visitors! This is one of the many options for adults to enjoy themselves- Disneyland isn’t just for the kiddos! Adults can have the happiest experience of their lives here too. The festival will feature a bounty of vibrant cuisine, celebrity chefs, entertainment and more! This year’s festival runs from March 1 to April 23, 2019. Save on Your Disney Adventure! Disneyland COMBO Hotel + Ticket Discounts Who says your vacation has to cost you a ton of money? Book your Disneyland tickets and hotel through our recommended travel sponsor to save big! Get free breakfast, free nights for your hotel stay, and more! Book now! Ready to Enjoy the Food & Wine Festival at Disneyland? The Food & Wine Festival features a variety of marketplace booths in the style that California Adventure typically uses for their food festivals with marketplace booths lined throughout the park. Each marketplace location will have a special menu all inspired by California grown ingredients. There are a variety of craft beers, wines, and food from across the region of California. You can see Disney’s Foodie Guide to the 2019 Food and Wine Festival here. Each year the festival features a Sip and Savor Pass which allows guests to save money by purchasing treats from the booths in advance. The pass costs $54 and is good for eight of your choice marketplace items excluding alcohol or souvenirs. The pass is a good deal if you plan on enjoying many of the food items offered or you can split a pass between a group too! These tickets are also good for multiple visits so you don’t have to use them all in one day. You can purchase the Sip and Savor Pass at Trolley Treats, Elias & Co., Seaside Souvenirs, the Sip and Savor Cart, the Festival Marketplaces, Festival Gift and Artist Corner and Studio Store in Hollywood Land. There’s plenty of learn on a variety of foodie topics during sessions with guests presenters Disney brings in to run these family friendly seminars. Chef Daniella presents fun and inspiring demonstrations to help even the busiest of families come together. The demos take place at the Backlot Stage in Hollywood Land on Fridays, Saturdays and Sundays at 3PM. This is something just for the kids! Aimed for age 3-11, kids can take a try at creating their own tasty recipes and hands-on cooking experiences with silly supervision from Chef Goofy. Each child gets a wrapped, ready-to-eat baked treat. The Jr. Chef kitchen is open for fun several times daily in the Hollywood Backlot. Daily showtimes are posted at the event location or check the Disneyland app. Jr. Chef is available on a first-come, first-served basis for children ages 3 to 11. Each year the Food & Wine Festival at California Adventure hosts a lineup of talented musicians at venues surrounding the festival. There are plenty of outdoor cooking options featuring a variety of local, visiting, and Disney chefs. The demos take place at the Backlot Stage in Hollywood Land on Fridays at 3PM and Saturdays/Sundays at 3PM, 4:15PM, and 5:30PM. These next events featured at the Food & Wine Festival offer advanced reservations. We recommend reserving your spot in advance so you don’t miss out as they often sell out! Watch as superstar chef Guy Fieri shares some of the secrets of his success, personal stories and a few of his favorite recipes. Watch the live demonstration on the Palisades Stage on Saturday, March 9th from 6:00 to 8:00 PM as Guy Fieri creates his signature dishes. After the event guests will be invited to sample the dishes! The cost is $120 per person, plus tax and gratuities for servers. Full payment is required at the time of booking, make your reservation here. *The tickets for the 2019 demonstration are now sold out. You can have the chance to attend a buffet brunch with a celebrity chef that will demonstrate their talents, answer questions, and meet guests. After the demo guests can take photos with the chef! This buffet brunch is a place for guests to learn how to create signature desserts with a celebrity pastry chefs along with the chance to meet the chef and ask questions. This year’s Sweet Sundays takes place from 11AM-1PM at the Palisades Stage in Paradise Gardens Park. This is a popular event so be sure to make your reservation ASAP! Full payment is required at the time of booking to secure your reservation. This is the place to go to learn about making wine, spirits, and beer as experts share their tips during 30-45 minute long sessions. The cost is $20.00 per person, tax included. Guests must be age 21 or older and present a valid photo ID to attend. No one under the required age, including infants or children accompanied by an adult, will be admitted into the venue. Full payment is required at time of booking to secure your reservation. This year’s Dinner with the Disney Chefs is on Thursday, March 28, from 6:30 to 9 p.m. in the Vineyard Room at Wine Country Trattoria. You’ll get to meet the Disneyland Resort chefs and sommeliers featured in the new Disney Festivals Cookbook, while you enjoy a four-course dinner with dishes and paired with hand-selected wines and cocktails. The cost is $225 per person, plus tax and gratuities for servers. Full payment is required at time of booking. Make your reservation as soon as possible- spots fill up quickly! Carthay Circle offers two nights of gourmet wine-focused pairings with wine from featured California wineries with carefully selected food to pair with the wines. Guests presenters from the wineries will also provide information about the wine and tasting notes. Guests must be age 21 or older and present a valid photo ID to attend. No one under the required age, including infants or children accompanied by an adult, will be admitted into the venue. Full payment is required at the time of booking. Annual Passholders get a special lanyard with their Sip and Savor pass along with collectible AP buttons at each marketplace they redeem their coupons at. Annual Passholders also get a discount on the Sip and Savor Pass along with their usual discounts on food and merchandise offerings along with special activities and a photo opportunity. 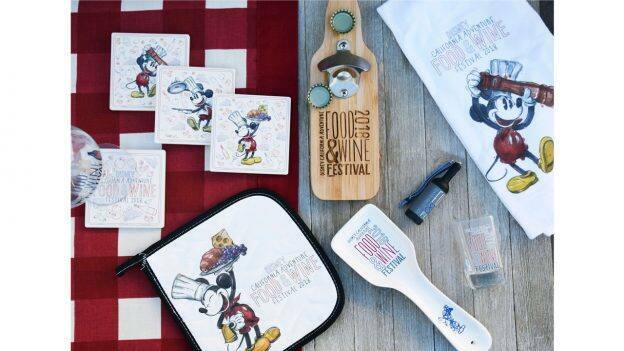 Each year the Food & Wine Festival offers a variety of themed merchandise aimed at catching the heart of cooking and wine enthusiasts. You will find a variety of items for the kitchen, home, along with traditional dated t-shirts and other items. Annual Passholders will also find items for purchase with unique Food & Wine Festival themes just for annual passholders. Next Post: Eight Classic Rides in Magic Kingdom That You Can’t Miss!